Jennifer Kay Davis, 48, of Des Moines, Iowa passed away on Wednesday, April 3, 2019 at Des Moines Methodist hospital. An informal celebration of life will be held at Maingate Bar and Grill on Saturday, April 13th, from 1 to 4 PM. Jennifer was born on October 26, 1970 in Des Moines, Iowa to Al and Judy (Fletcher) Davis. 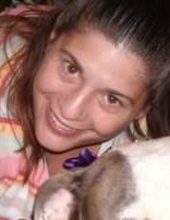 Jennifer was an avid reader, music enthusiast, and animal lover. She enjoyed spending time with her family and dogs. Jennifer is survived by her father, Al Davis, her brother, Kenny Long, her daughter, Samantha "Kennedy" Hill, her spouse Dale Crutcher, and countless friends. She was preceded in death by her mother, Judy (Fletcher) Davis. To send flowers or a remembrance gift to the family of Jennifer Davis, please visit our Tribute Store. "Email Address" would like to share the life celebration of Jennifer Davis. Click on the "link" to go to share a favorite memory or leave a condolence message for the family.